Join forces with your family, friends, neighbours, and coworkers. Start a friendly competition with your teammates to raise more funds and enjoy a great day where you’ll meet other members of your local kidney community. Your footprints will make vital research possible and provide important support and programs for people affected by kidney disease. You can become an active and important member of the kidney community. Join the online network, share your story, learn from one another and stay connected. 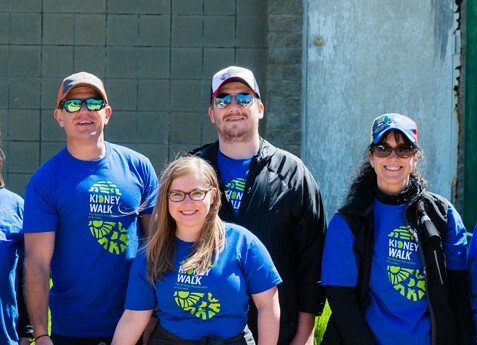 JOIN THE TEAM!New to the Kidney Walk? Here are a few tips and resources to help you get started with your fundraising. You must register for this year’s walk, but you can use your username and password from last year to keep your donation history and personal page story and photos. May 25, 2015, is a day I’ll never forget. It wasn’t my birthday, but it might as well have been... Thanks to my dad who gave me one of his kidneys, that was the day I stopped surviving and began living again. The Kidney Walk has become my way of talking about kidney disease and organ donation, and of sensitizing people to the cause. Since receiving a kidney transplant on September 30th 2014, every morning I am thankful to that amazing donor; and every day I am on the lookout to find ways to support The Kidney Foundation of Canada, the truly world-class researchers they fund, and the comprehensive support offered to people living with the challenges of kidney disease. Kidney Walk is coming and on behalf of my family, we’d love to see you out there! When all 4 of your kids are affected it becomes a part of your life mission. The day itself usually brings tears to my eyes... it's an emotional day, both happy and sad. You hear of successes met with hardships and disappointments. It's a comradery of caring, passionate people who understand what the effects of living on dialysis is all about, and who go to extremes to raise some serious cash. It's heartfelt every year!